At long last, the secrets of the mysterious East are revealed! Cathay — where family honor is paramount and beauty can be found in everything from a humble rice bowl to a carved jade talisman. Meet the inhabitants of the Seven Kingdoms, from the horsemen of Xian Bei to the fierce pirates of Tiakhar. Charged with the tien ming — the Mandate of Heaven — the beautiful young Celestial Empress rules over the fabled nation as she battles forces that seek to topple the Dynasty and unleash terror throughout the land. 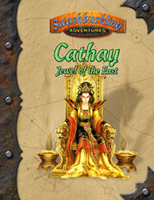 Fully compatible with both d20 System TM rules and the classic 7th Sea system!